Flood watches have been issued for the NSW coastline with flooding warning evacuations on the north coastal regions. As you can see from the radar tonight, lightning and widespread heavy rainfall is approaching the regions of the lower Hunter Valley and Sydney regions. 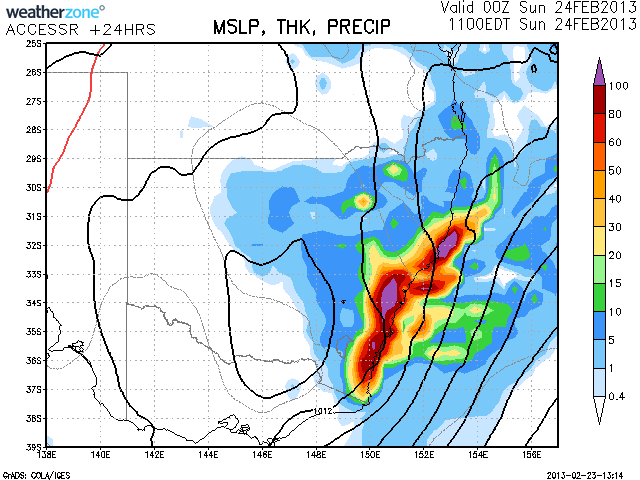 Rainfall totals exceeding 100mm can be expected based on the Bureau models nearer the Blue Mountains but even perhaps Western Sydney may receive higher totals. Where is the major rainfall Jeff? 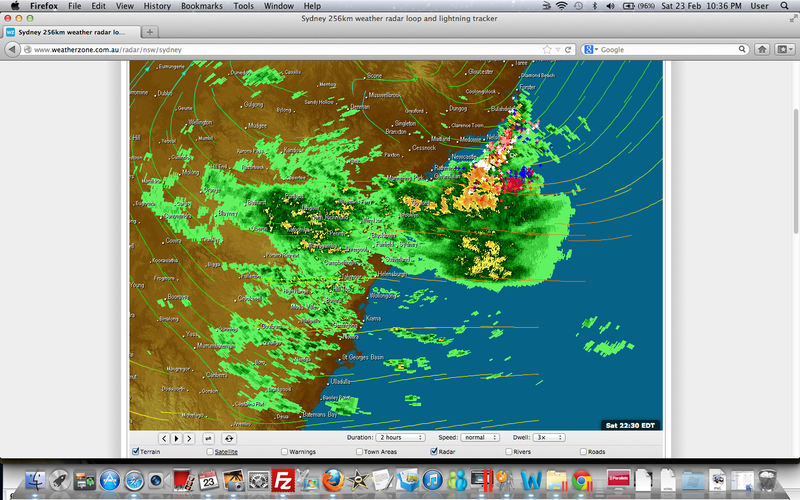 Looks like the rain system moved off the coast of Taree. I would say storms are expected today. Sorry that was my message on Imeld's Facebook account. 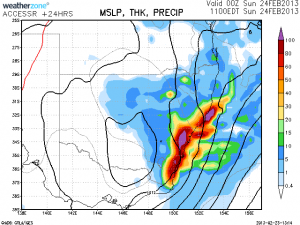 Anyway, I would say that the storms are likely to develop and produce heavy rainfall. We copped 29mm of rain here in Schofields with frequent showers and rain periods. Not sure what happened overnight as I was in deep sleep. Just interrogated the models – a good chance of storms today. If they do occur they will reach deep into the atmosphere. thunder & lightning over sydney central most of last night – did you capture any of it? Alup, I can assure you, last night in particular, I could have slept through a nuclear bomb blast. So no pictures from me. Anyone else get any? Apparently my friend Ray from Hurtsville and another friend wollongong told me it was a wild night! Trees were brought down in some areas. Just checked the radar and the storms are developing further north and moving generally south. 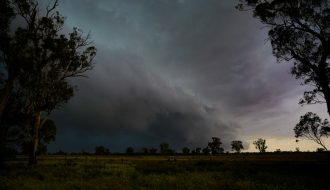 Severe thunderstorm warnings are current for the regions Hunter north. Was a very wild night in punchbowl from around 11.30pm to 1am, Never seen rain coming in so hard in my life….It brought brick walls down a few doors up from my house. 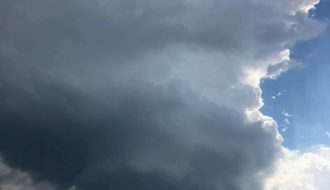 I love a good storm, Be safe out there folks. WOW! Any pictures there Gazz? Post them here – we would love to see what you have thanks. I just got back from the club. Longer story, we were in the cub for a night draw. The draw meant I had to be there form 7:#0pm onwards. 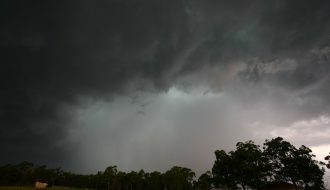 Of course, the storms came into Sydney slightly before this time and I was able to film locally two of the storms! I got time-lapse of the first and partially of the second which was moving reasonably quickly! 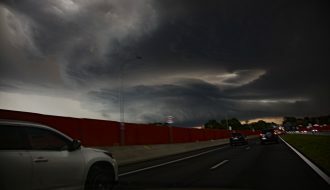 I got some footage and photos of them from Wentworthville, sorta looked like a wall cloud trying 2 develop. I think there was strong inflow with the 1st 1! There is a cell tracking SE Possibly along a boundary over the Blue Mountains right now. Possible supercell but hard 2 say at this stage. Tried to get pics of the driving rain but camera wouldn't pick them up, I will upload pics of the wall soon though. I just spent 3 days on the western slopes of the Snowy Mountains between Talbingo and Corryong. I was amazed at how the Snowy Mountains influenced this weather system. From where I was, I could see the thick cloud associated with the weather system moving south along the coast to the east. On Saturday, I drove from Talbingo where it was calm and across the Snowy Mountains. Once I reached an elevation of about 1,500 metres, I drove into gale force winds associated with this weather system. These winds were so strong that they were stripping bark off trees, tree branches were coming down and I found it hard to stand upright when out of the car. Near Kiandra, I drove into light rain and low cloud and it was bitter cold. Further east, the rain was much heavier. Yet by the time I reached Cabrumurra, I found that none of the rain that was falling on the eastern sea board was getting across the Snowy Mountains. A spectacular rain shadow was evident across a very short distance (east to west). I stood on a lookout and from about 1,600 metres in elevation, I could see to the west where it was hot and sunny in the Upper Murray Valley but to the east, it was cool, cloudy with rain falling. That rainfall was heavier further to the east. I drove down to Corryong which is below the Snowy Mountains from near icy cold conditions via Tooma Road back to summerlike conditions. In the space of 1 hour, I went from bitter cold conditions, cloud and near freezing rain to summerlike temperatures of 32C. From Towong Pass near Corryong, I could see how the Snowy Mountains were influencing the weather system with Mt Kosciusko clothed in thick cloud and cold rain yet it was roughly 32C where I was. I caught a glimpse of Mt Jagungal during this drive but that peak was clothed in heavy cloud and light rain. Where I had frigid cold gale force SE winds at 1,600 to 1,800 metres in elevation near Cabramurra, at Toowong Pass, I had no wind except for a light ENE breeze that was warm and dry. The Snowy Mountains were acting like a classic mountain barrier to this weather event. 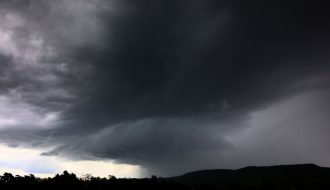 Air rising up on the eastern side was saturated with moisture as I found out at Kiandra. The precipitation was being dropped on the eastern side and on top of the ranges. 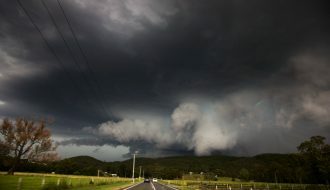 Cabramurra was on the very edge of the rainfall and at a point where all the clouds were completely breaking apart. On the western side, the air was descending and much drier. 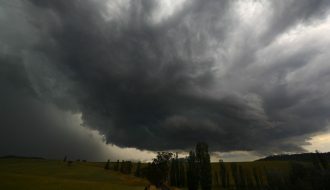 My drive over 5 hours from Talbingo to Corryong took me through a number of weather set ups from this weather system from warm dry conditions, to near freezing conditions, then to cold rain, windy conditions then back to summerlike conditions. 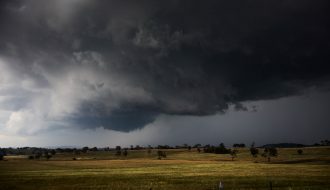 So while the coast was affected with the heavy rain and storms, none of this was crossing the Great Dividing Range or Snowy Mountains especially in the southern part of the state. Harley, that was one adventurous observational experiment! Well covered and on depth report. I have heard through sources that Sydney Water will has or will release some water from Warragamba Dam. Any word of the validity of this source? The river at Penrith was reasonably high and speaking to Jeff last night and he said that it has gone up to 95% capacity. I was passing through the Camden By-pass and saw some evidence of small trees felled by strong winds from the event directly related to this event. There were even tarpaulins on top of some houses!